From the oil crisis and stock market crash in the 1970s through deregulation into the 1990s to the 2008 financial crisis--every financial planner worth their salt turned to Victor Hallman and Jerry Rosenbloom's classic reference for answers. To maintain its iconic position in the industry, this bible of wealth development moves into its Ninth Edition to ensure today's professional investors and financial stewards have reliable guidance to the latest legislation, economic developments, and wealth management trends and techniques. Major new tax legislation, including the "Tax Relief, Unemployment Insurance Reauthorization and Job Creation Act of 2010" and the "American Taxpayer Relief Act of 2012"
New developments in estate and marital deduction planning such as "portability"
This completely updated edition remains a wealth-building and income management tool by presenting many useful strategies, including those for dealing with the current "super-low" interest rates. 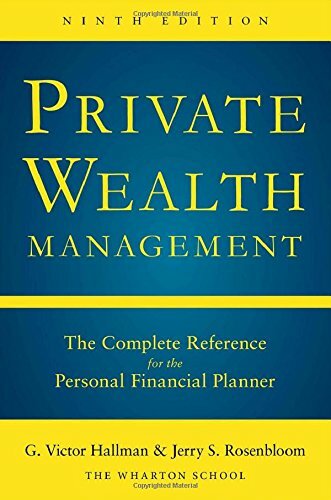 Private Wealth Management, Ninth Edition, is the cornerstone of financial planning.